Schweitzer Mountain Resort is the biggest ski resort in Idaho and Washington with 2,900 acres, more than more famous Sun Valley at 2,100. Schweitzer is also beautiful – in heart of the Selkirk Mountains overlooking Lake Pend Oreille, the Rocky Mountains extending into northern Idaho’s panhandle – just 50 miles to Canada and Schweitzer’s sister resort Whitewater in Nelson BC. 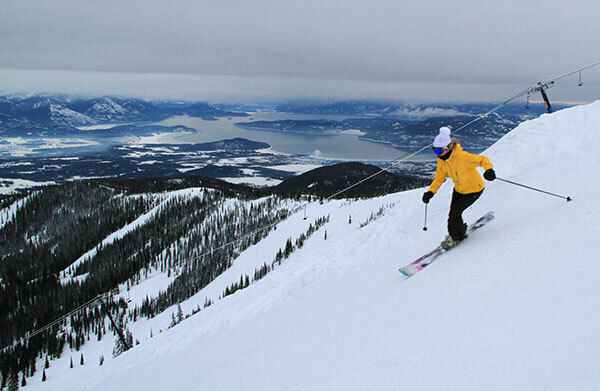 See photos of skiing Schweitzer in Idaho. Schweitzer feels big, with five distinct ski areas on varying aspects on 2,400’vertical, truly terrain for everyone in your ski family. Schweitzer Bowl on the front side has groomed steep runs and powder bowls with perfectly spaced trees serviced by speedy quads, and the Stomping Ground terrain park just above the Village. On the back side Outback Bowl offers a plethora of steeps and groomers in an entirely different alpine aspect. Stella six-passenger chair serves more moderately pitched groomed runs peppered with a few fun glades in a protected pocket, while the Snow Ghost Double climbs 1,900’ vertical bringing you to steeps and expert chutes, along with the resort’s longest run – 2.5 mile Little Blue Run reached by a short summit T Bar. Schweitzer’s lower mountain Musical Chair area, below the Lakeside Base Lodge, offers a gently sloped learning area for beginners. Schweitzer is the Lake Tahoe of Idaho (according to us) for its beautiful panoramic views . On a clear day you can see as far as Montana, Washington, The Canadian Rockies and most impressively Lake Pend Oreille (ear lobe in French – named for it shape) – the spectacular lake that spreads below and sparkles in the sunlight, spectacular at sunrise and sunset. With so much terrain, from consistently pitched steeps to wide groomers and family friendly terrain, you could spend a week- or a season exploring Schweitzer. You can also find different alpine climates when the Pacific Northwest weather moves in, foggy on the Front, go to the Outback. Cat skiing at Schweitzer is a cool day option, once you have cycled all the powder in bounds, Selkirk Powder Cats offers cat skiing on an additional 3,000 acres starting from Schweitzer’s summit. Schweitzer Mountain Village is relatively new, very well laid out to resemble a European ski village with the quintessential clock tower (sponsored by Toyota). All the modern alpine conveniences are steps from the ski lifts. You can lodge at Selkirk Lodge or White Pine Lodge in Schweitzer village – both offer condo style suites with tasteful rocky mountain decor, you can walk to the Solstice Spa for a massage, the shops, wine and cheese tastings at Gourmandie, and dinner at Chimney Rock Grill. Happy hour at Pucci’s Pub is cozy and local, while après ski at the bigger Taps Bar often features a band, and there’s a view of the Lake and the ski slopes from this upstairs of aptly named Lakeview Lodge, where base lodge services are also located. Families love Schweitzer’s laid back feel, and the kids programs. There’s Hermit’s Hollow snow tubing park, a zipline, and the heated pool, plus outdoor hot tubs for parents. Organized kids activities inlcude après ski movies, arts and crafts, movies and bonfires throughout the week and weekends, along with twilight skiing on Friday and Saturday and school holidays. For lodging off mountain, the cool western-style lakeside town of Sandpoint, on Lake Pend Oreille, is just 15 minutes down the access road from Schweitzer ski resort. Sandpoint is a fun festive town to shop, watch the sunset at Trinity Beach Club, and stay at a less expensive hotel, La Quinta, Days Inn, Best Western, Quality and Holiday Inn, versus at Schweitzer Mountain Resort. Schweitzer is Idaho’s biggest skiing, its beautiful and when the sun shines on Schweitzer with fresh snow, there’s no better skiing in Idaho. A Schweitzer ski trip could be combined with a day skiing Lookout Pass for a day, and a visit to Silver Mountain near Coeur D’Alene.